As announced by Publishers Marketing Association at the Wilshire Grand Hotel in Los Angeles, May 28, 2003, Baltimores Own Little Italy Artist  The artwork of Tony DeSales, by Rita D. French, Perrin L. French and Irvin F. Lin (Genovefa Press, © 2003, $29.95), was accorded the Silver Medallion of the Benjamin Franklin Awards for this years most outstanding publications in the category Autobiography/Biography/Memoirs. 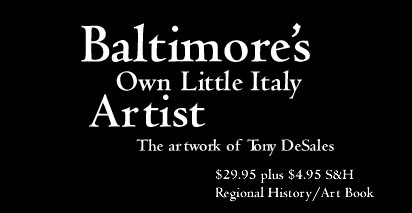 Baltimores Own Little Italy Artist  The artwork of Tony DeSales (Genovefa Press © 2003, ISBN 0972359001) is a clothbound 8.5 x 11 edition of coffee table quality, complete with bibliography, full index and map. It is 244 pages and retails for $29.95 at Borders, Barnes and Noble, Waldenbooks, Readings and Greetings, Home Town Girl, and other fine bookstores, as well as on the web from www.Amazon.com, www.LittleItalyMD.com and www.genovefapress.com. Contact: Rita French, (650) 324-0575, or via email: ritaf@aol.com.